Now, son of man, I am making you a watchman for the people of Israel. Therefore, listen to what I say and warn them for me. 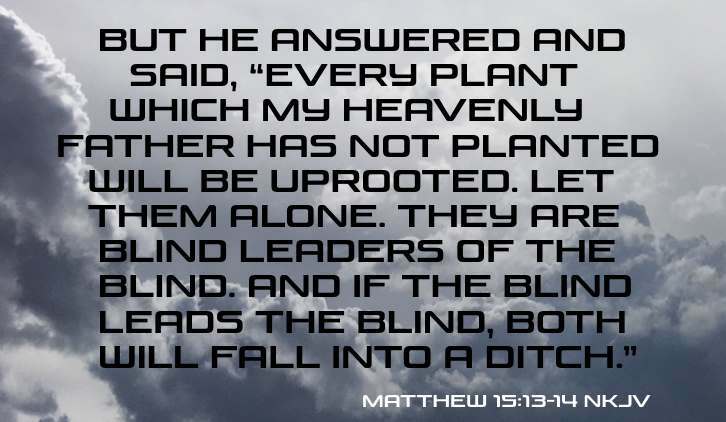 If I announce that some wicked people are sure to die and you fail to tell them to change their ways, then they will die in their sins, and I will hold you responsible for their deaths. 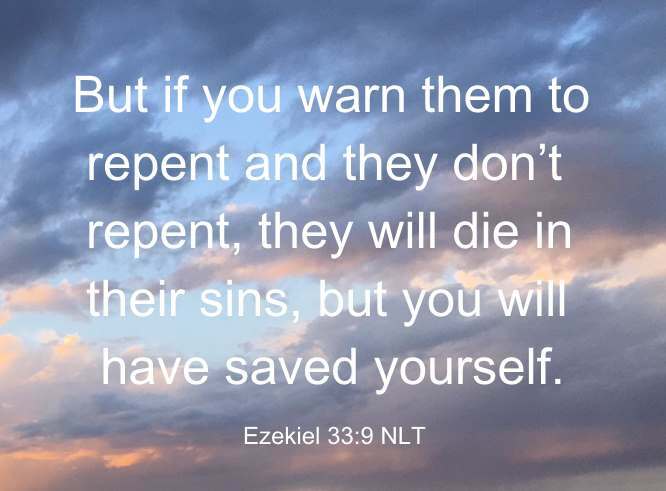 But if you warn them to repent and they don’t repent, they will die in their sins, but you will have saved yourself (Ezekiel 33:7-9 NLT). The saying is trustworthy: If anyone aspires to the office of overseer, he desires a noble task. Therefore an overseer must be above reproach, the husband of one wife, sober-minded, self-controlled, respectable, hospitable, able to teach, not a drunkard, not violent but gentle, not quarrelsome, not a lover of money. He must manage his own household well, with all dignity keeping his children submissive, for if someone does not know how to manage his own household, how will he care for God's church? He must not be a recent convert, or he may become puffed up with conceit and fall into the condemnation of the devil. Moreover, he must be well thought of by outsiders, so that he may not fall into disgrace, into a snare of the devil (1 Timothy 3:1-7 ESV). For an overseer, as God's steward, must be above reproach. He must not be arrogant or quick-tempered or a drunkard or violent or greedy for gain, but hospitable, a lover of good, self-controlled, upright, holy, and disciplined. He must hold firm to the trustworthy word as taught, so that he may be able to give instruction in sound doctrine and also to rebuke those who contradict it (Titus 1:7-9 ESV). So I exhort the elders among you, as a fellow elder and a witness of the sufferings of Christ, as well as a partaker in the glory that is going to be revealed: shepherd the flock of God that is among you, exercising oversight, not under compulsion, but willingly, as God would have you; not for shameful gain, but eagerly; not domineering over those in your charge, but being examples to the flock (1 Peter 5:1-3 ESV). Preach the word; be instant in season, out of season; reprove, rebuke, exhort with all long suffering and doctrine (2 Timothy 4:2). And he gave some, apostles; and some, prophets; and some, evangelists; and some, pastors and teachers; For the perfecting of the saints, for the work of the ministry, for the edifying of the body of Christ (Ephesians 4:11-12). Do your best to present yourself to God as one approved, a worker who has no need to be ashamed, rightly handling the word of truth (2 Timothy 2:15 ESV). 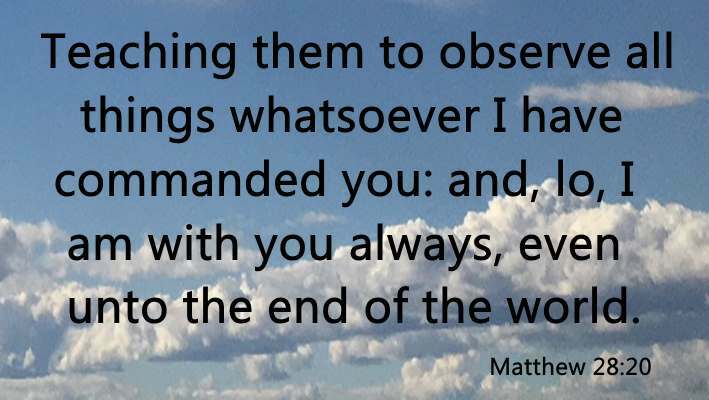 Teaching them to observe all things whatsoever I have commanded you: and, lo, I am with you always, even unto the end of the world. Amen (Matthew 28:20). And He said to them, “Go into all the world and preach the gospel to every creature (Mark16:15 NKJV). As you just read, the job description that God gave pastors, for the most part, is easily understood. If your pastor is living a life different than what God has instructed him to do, shame on him. If God has given you the knowledge and understanding that your pastor isn't doing what God has instructed him to do and you choose to stay and be guided by him, shame on you. So if your pastor does not preach that you must obey Acts 2:38 to be saved, you will know that he is not fulfilling his responsibilities to God and will be held accountable as the watchman of your souls. Unfortunately though, if you do not obey Acts 2:38, you will not be saved, and will suffer the same consequence as your pastor, i.e. not spending eternity with our Great God and Saviour, Jesus Christ. What it means "to believe"
When He had called the multitude to Himself, He said to them, “Hear and understand: Not what goes into the mouth defiles a man; but what comes out of the mouth, this defiles a man.” Then His disciples came and said to Him, “Do You know that the Pharisees were offended when they heard this saying?” But He answered and said, “Every plant which My heavenly Father has not planted will be uprooted. Let them alone. They are blind leaders of the blind. And if the blind leads the blind, both will fall into a ditch.” (Matthew 15:10-14 NKJV). Don't let this happen! Go to Church Directory, and find a church where Acts 2:38 is preached.